Even after numerous products made with artificial sweeteners became available, sugar consumption per capita continued to rise. Now manufacturers are introducing fat-free versions of various foods that they claim have the taste and texture of the traditional high-fat versions. Even if the manufacturers' claim is true, given that the availability of sugar-free foods did not reduce sugar consumption, it is unlikely that the availability of these fat-free foods will reduce fat consumption. Which of the following, if true, most seriously undermines the argument? A Several kinds of fat substitute are available to manufacturers, each of which gives a noticeably different taste and texture to products that contain it. B The products made with artificial sweeteners did not taste like products made with sugar. C The foods brought out in sugar-free versions did not generally have reduced levels of fat, but many of the fat-free versions about to be introduced are low in sugar. D People who regularly consume products containing artificial sweeteners are more likely than others to consume fat-free foods. E Not all foods containing fat can be produced in fat-free versions. Even after numerous products made with artificial sweeteners became available, sugar consumption per capita continued to rise. This is a little bit of a let down as a sentence because of the first part says that several products made with something are supposed to be new are on the market, however, the classic ones with sugar are on the rise. MMhhh very weird. So far not so good. Go ahead with the analysis. Now manufacturers are introducing fat-free versions of various foods that they claim have the taste and texture of the traditional high-fat versions. 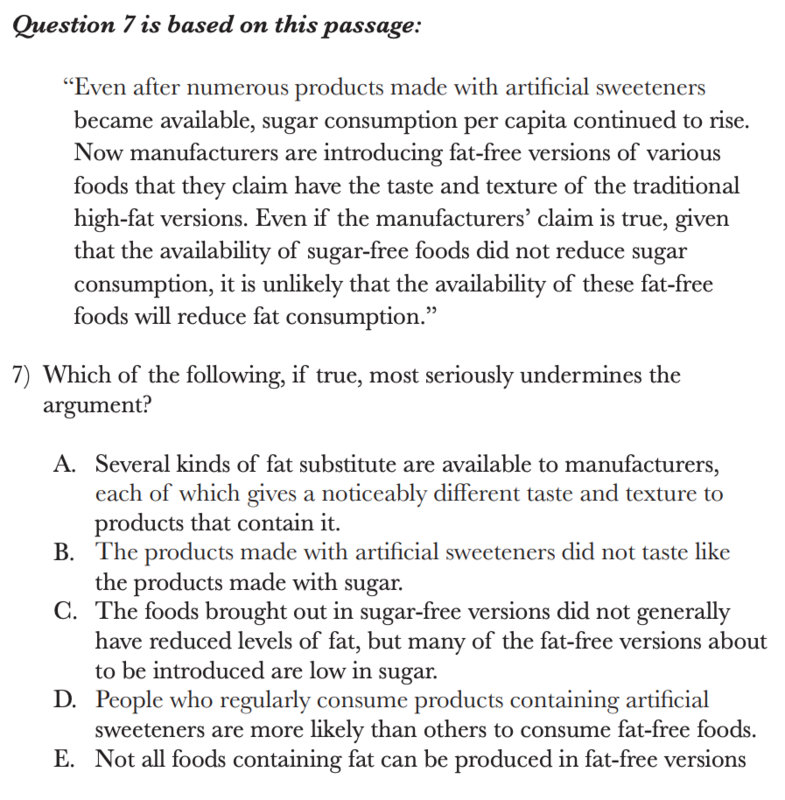 Even if the manufacturers' claim is true, given that the availability of sugar-free foods did not reduce sugar consumption, it is unlikely that the availability of these fat-free foods will reduce fat consumption. This is the locus of the entire stimulus and what we are going to weaken or reinforce or else based on the information provided into the stem further. 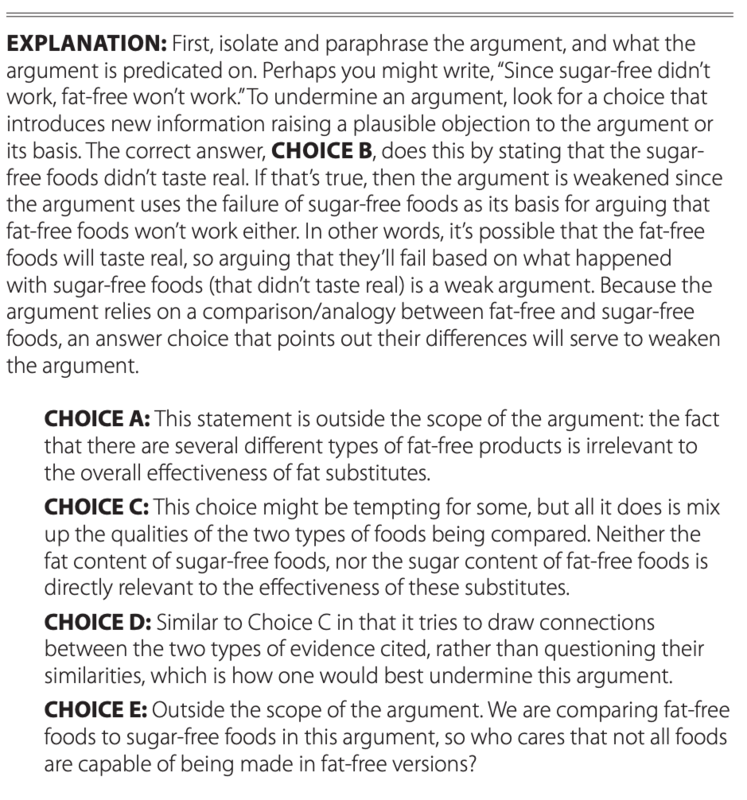 Actually what is saying here is this: if the sugar-free didn't work, I do not see how the fat-free will work now. if X didn't work, neither Y will do. We have to weaken this claim with a valid reasoning that counteracts this statement. This statement nothing brings in to our goal. It is completely out of scope. The fact that there are several or different types of fat-free food we do not see how is possible to weaken the last sentence we talked about and the overall stimulus. Actually, we said that if X doesn't work, Y will not work as well. And another key information was that the new sold food is the same texture and taste as the previous (which means in terms of aspect AND taste they is the same) BUT this is what manufacturers claim and this is could not be true, also. Indeed, the new products are NOT the same. So they might succeed or not. We do not know. However, what is important here is that we weakened the argument because they are not the same if it is true. keep in mind this. Our goal is to disprove the claim if X does not work then Y will do the same. Saying that the taste is different does exactly this. if then they do not sell is not our concern. They could not but also COULD. The comparison among people is out of scope. Move one. There is nothing more to eviscerate or explain here. We are saying that not all food could be produced in a certain version rather than in another version.....honestly, who cares. To put this a different way, let's take a look at how this argument is set up. The author believes that, even if the fat free foods taste identical to the normal version, it is unlikely that the availability of fat-free foods will reduce fat consumption, because the availability of sugar free foods did not reduce sugar consumption. In other words, the author is claiming that the 2 situations are the same, so the outcome will be the same. When we pick the answer, we want to pick the answer that shows that the comparison is not valid. B tells us that the sugar free foods tasted different from the normal foods. This is unlike the fat free foods, which we assume taste identical to the normal food. Therefore, the comparison is not valid. The best way to study for the GRE is through an error log. Check out this GRE error log on Google Sheets. It's created by Trevor Klee, Tutor, a top rated, 99th percentile scoring GRE tutor, available for in-person (Boston-based) and remote tutoring. We need to prove that there was some other reason which effected the sugar consumption to weaken the statement which is correlated with fat free content thing. Only B is closest answer option. Attached is a visual that should help.